Drought is what makes Oldman Saltbush shine. It gives you both feeding & management options. Like all good things, it takes time to advancements happen and to be able to prepare yourself for this level of feeding & management security. If you establish Oldman Saltbush in the good times - it will look after you in the bad times. With as little as 5% of your grazing area planted with Oldman saltbush, there will be a markedly enhanced drought management ability for your business. If 10% is planted, properly developed and utilized, even fairly severe droughts will have little bottom line impact. Oldman saltbush is a fodder crop like no other when it comes to drought management. And, like all other plants, the better the soil you plant it on ,the better the growth & your grazing results will be. The plant is naturally a water efficient plant, due to it having numerous water-saving attributes. For every litre of soil water utilized, it has the ability to produce up to three times more feed than most other grazing plants. The deep, spreading roots and higher soil carbon levels created allow your soils to achieve a superior rate of water infiltration as well as water holding capacity, and all to a deeper level into the soil. 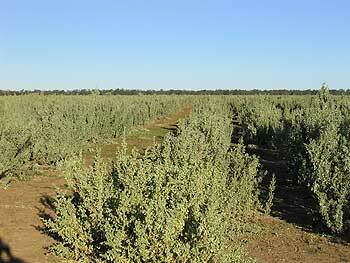 Utilizing Oldman saltbush enables land to be productive with far less water demands. It increases the ability of an entire agricultural business to survive during conditions that other properties find troubling. In times of drought, Oldman saltbush dramatically increases your chances, your options and your peace of mind. People with Oldman Saltbush planted actually do enjoy droughts. For some pictures of Oldman Saltbush's performance during drought click here. Karl's version of Parkinson's Law: Work expands to exceed the time alloted it.